"Chicken tenders are seasoned with homemade baharat mix. This recipe makes a main dish for 3, or, if served in flatbread wraps, it will feed 4." Combine sweet paprika, pepper, cumin, coriander, cinnamon, cloves, cardamom, star anise, and nutmeg in a small bowl and stir to combine. 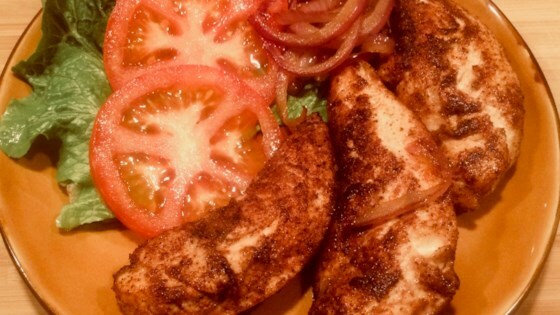 Place chicken tenders on a plate and sprinkle one side with 2 teaspoons of the spice blend. Season with sea salt to taste. Turn tenders and sprinkle the other side with an additional 2 teaspoons of the spice blend; add salt to taste. Store remaining spice blend in an airtight container and reserve for another use. Heat a skillet over medium heat. Pour in olive oil once skillet is hot and heat until it shimmers. Carefully place chicken tenders into skillet one at a time, making sure they don't touch each other. Cook for 4 1/2 minutes, turn, and cook until chicken is no longer pink in the center and the juices run clear, about 4 1/2 minutes more. An instant-read thermometer inserted into the center should read at least 165 degrees F (74 degrees C). Remove chicken from skillet and drain on a paper towel-lined plate. Add onion to the same skillet and cook until soft and translucent, about 4 minutes. Remove onion slices and drain on paper towel-lined plate. Serve onions with chicken.